I’ve dreamed of that day for the last several years, ever since I took my Spanish son into a recording studio and produced his first CD. July 4, 2014 is the day when the music of Pedro González Arbona, the musical protégé whose career I help manage, will fill the theater as it accompanies his first full-feature American film, Tempting Fate. I feel blessed beyond words to join Pedro in Houston, Texas for the private VIP screening of the movie. Pedro signed the contract with KevStel Group, an Atlanta-based production company, for Tempting Fate while I was staying with his family last summer in Spain. Within days we were on holiday on Mallorca, an island off the southern coast of Spain, without access to a piano. We both read the script while on holiday. I sat poolside one day and read the page-turning script in one sitting. Tears welled up at the corner of my eyes as I read through the last scene. I could already see the music that Pedro would create for the poignant movie finale. It was perfect for him and his music. That script was all Pedro needed to start composing in his head and making notes in the margins on what kind of music to add to a scene. And he was on his way to scoring the soundtrack. Pedro at work in his studio. 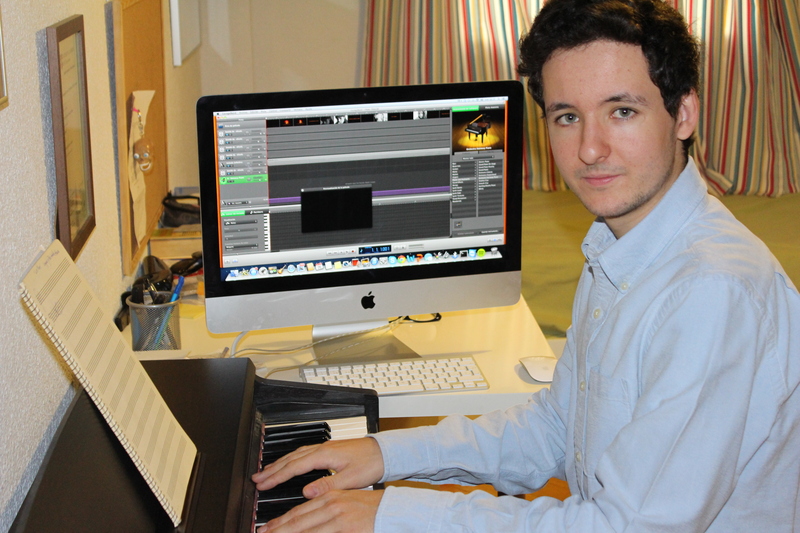 Over the next several months, Pedro worked remotely composing and orchestrating the soundtrack from his studio while the filming was done in Hollywood. After the film was done, he worked his magic to synchronize the music to the scenes—editing, revising, and composing on the fly to make the music work in tandem with the movie. One of the most exciting parts of the process for Pedro was to be in the studio with the musicians who were hired to record the music—a pianist, violinist, percussionist, and guitarist. An American soprano was hired to sing as well. Throughout the filming and post-production stages, Pedro’s music started to trickle out onto the internet. 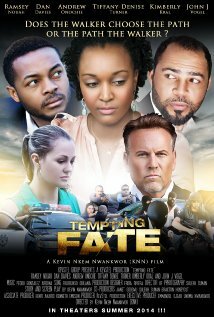 KevStel used his music for various promotional videos, as background music on their website (with the soprano), and finally, on the Tempting Fate movie trailer, released March 28, 2014. I waited and watched in eager anticipation all along the way. When the conversations turned to the release of the movie a few months ago, we both had much anticipation for how or if we would be able to attend the pre-release screenings. He was of course invited, but travel from Madrid would be costly. After much back and forth planning and juggling, we both committed, and a few days ago finally secured our travel to Houston. As the countdown calendar on the right sidebar of my site turns from months to days, we have turned our attention to rolling out a new website, registering a new domain name, and creating other promotional materials to coincide with the release of the film. The Tempting Fate soundtrack CD will be available in the coming months—and you’ll be able to enjoy it like I have as I wrote this piece. Finally, the main purpose of the screening is for media exposure and to line up distributors for the film. You can help with that by creating a positive buzz about the movie and the music through your regular social media channels. So please ‘like’ the Tempting Fate Facebook page (over 10,000 likes already) and share the movie trailer (almost 20,000 views so far) with your friends (or share this post). Over the course of this movie project, my role was very minimal. Pedro would occasionally send me a song and gave me updates on the film’s progress. I learned a great deal from him about the process. I basically served as an encourager and #1 American fan of his music—as I have from the start. I think my biggest contribution was to pray for him, his music, and the success of the movie. It is definitely an exciting time for Pedro and his music career. I’m incredibly grateful that I get a front row seat (maybe literally) to watch all of this unfold. I know there is no place else I’d rather be on July 4, 2014, than alongside Pedro as his music hits the big American screen. While everyone else in America is outside watching the fireworks, we’ll be inside this Houston theater experiencing our own private fireworks display across the screen. I think this day will be an Independence Day celebration we will never forget! Great post, Ardis. I am excited for Pedro and the world as his music gets out there! Congrats to your son and you for your accomplishments. It looks like a great film and the music sounds wonderful.